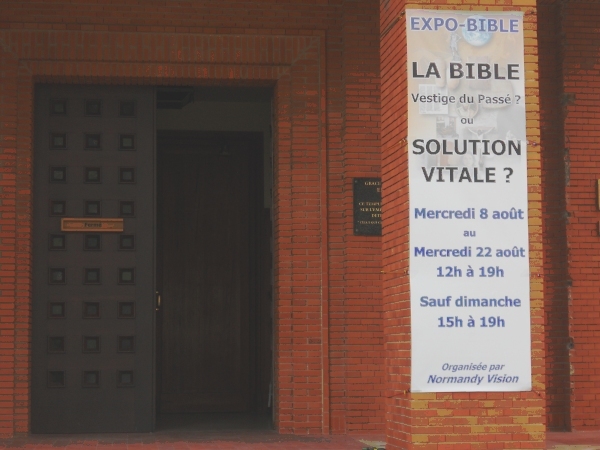 Despite the fact that earlier this year there was a real possibility that this year's Bible Exhibition - "Expo-Bible" - at Houlgate would not be able to be held, the fifth annual exhibition was the best one that has taken place. Wednesday, August 8th through to Wednesday, August 22nd inclusive. A total of approximately 270 people visited the exhibition, which as a daily average is about the same as last year. Like last year, too, there was a reduced number of holidaymakers in the area. Some days the beach looked almost empty - despite the warm sunny weather, the extensive sandy beaches, and the calm sea. We also sold about 30 Bibles and around 50 Christian books from the bookstall. There were many interesting contacts made this year, with a lot more interaction with visitors by way of conversation. This was partly because we had a bigger team this year, which included Tim and Jenni Moore, Pamela Green, Clive Brennan (p), Michael and Monica Stringer (p), Philip and Simone (p) Loose. [(p) indicates that the person or couple could only be there for part of the time]. 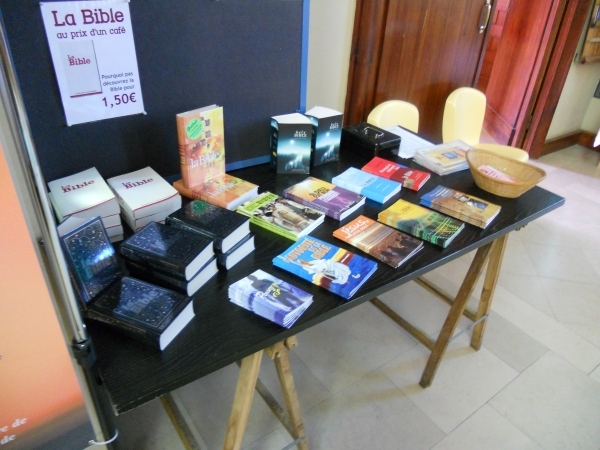 As in previous years we had a bookstall as part of the Expo, and over 30 Bibles and 50 Christian books were sold. In addition, a very large quantity of Gospels and tracts were taken by visitors, or were handed out by team members during conversations with the visitors. One of the many highlights of this year's Expo was on the first Saturday. A mother and daughter walked across the gravel from the gate to the church exhibition with seemingly radiant smiles on their faces. When talking to one of the members of the team they explained that they had visited the church for a previous Expo. It was a couple of years ago, and the mother sent in a response card after the Expo to ask for more information about what it means to be a Christian. As a consequence of sending in that card she was put in contact with the pastor of an evangelical church located about 400 metres of so from where she lived. She said that she and her daughter had since become Christians. Hence the radiant smiles! On the opening day of the Expo a Christian family toured the Expo. At the end the father bought about 50 euros worth of books and Bibles. He turned out to be a pastor in a multinational church in Germany and was stocking up on resources for his work among French-speakers in the area. On the first Saturday, a Parisian dad called Stéphane had a long discussion with one of the team members. He was very serious about reading the Bible and said he wanted to come back to ask further questions. Four days later he came back and had a further conversation with the team member. They spent quite a lot of time together looking at passages in the Bible such as Isaiah 53 and Psalm 22. Stéphane had brought his own Bible with him, and later emailed the team member to thank him for all the encouragement that he had received from their time together. A retired teacher who lives in the flats opposite the church at Houlgate went round the Expo. She is a Catholic and spent some time at the end of her visit talking with one of the team about the Bible, faith and teaching. The team member she talked with was also a teacher, so there was a good connection. She was invited to the meeting where Allan Kitt answered the question "Why read the Bible today?" (see below) - and she came. She then came back on the last day of the Expo to say goodbye to the team member who was then able to talk with her about the Gospel. Please pray that she will read her Bible and think about the Gospel of salvation through faith alone in the Lord Jesus Christ and not by trying to live a good enough life. Many visitors were from a Catholic background, yet were often unfamiliar with the Bible. Some however were concerned to know and understand the Bible a lot better. For example, one day a young Catholic lady from Paris visited the Expo. She said that she spent time reading her Bible and trying to understand it and wanted advice on how best to read it and where to start. On the final Monday of the Expo some nuns on holiday at a nearby Catholic Centre came to visit. Some of them had been to visit the Expo last year and one of the nuns had taken a free copy of a Gospel at the end of that previous visit. She didn't keep her copy for long though! She said that she had met someone on a train journey and as a result of their conversation, she decided to give her copy of the Gospel to him. She said that she had given him the best present she could give and then made a comment that she thought Protestants often seemed to be so much better at studying and sharing the Bible than Catholics were. The nun said that "Catholics don't even come up to the Protestants' ankles when it comes to the Bible"! On the last Tuesday of the Expo a Muslim man from Morocco, who was on holiday in the area, called in to the Expo. He was a schoolteacher and he listened intently to the personal testimony of one of the team members. At the end of their time together he took a Gospel to read. Sometimes the team met people who were going through very difficult times in their personal lives. For example there was a young dad who didn't go round the Expo but just came and sat for a while in the calm and quiet of the church. Talking to one of the team on the way out he said he was in a very distressed state as he had been recently divorced. He didn't want the divorce to take place, and it meant that he didn't see his children very much anymore. One of the team was able to spend some time talking with him. On another occasion, a lady came in with her father, who had suffered from a stroke. She had recently lost her mother after spending the last eight years nursing her full time. She was now having to face a new start to life in her late fifties. She listened to the personal testimony of one of the team members and took some literature away. On the second Saturday of the Expo (18th) a group of Egyptian Christians called in. 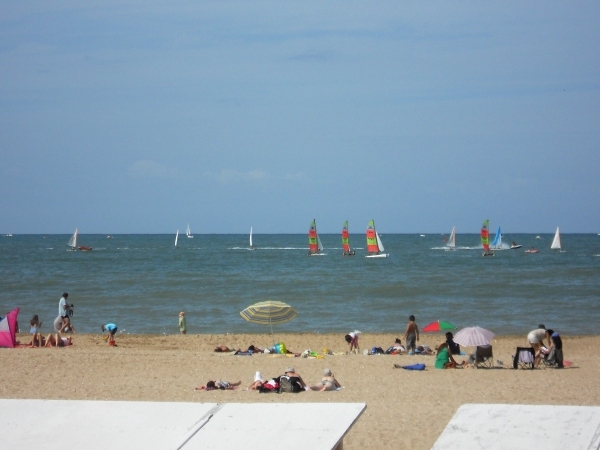 They were staying in Houlgate. 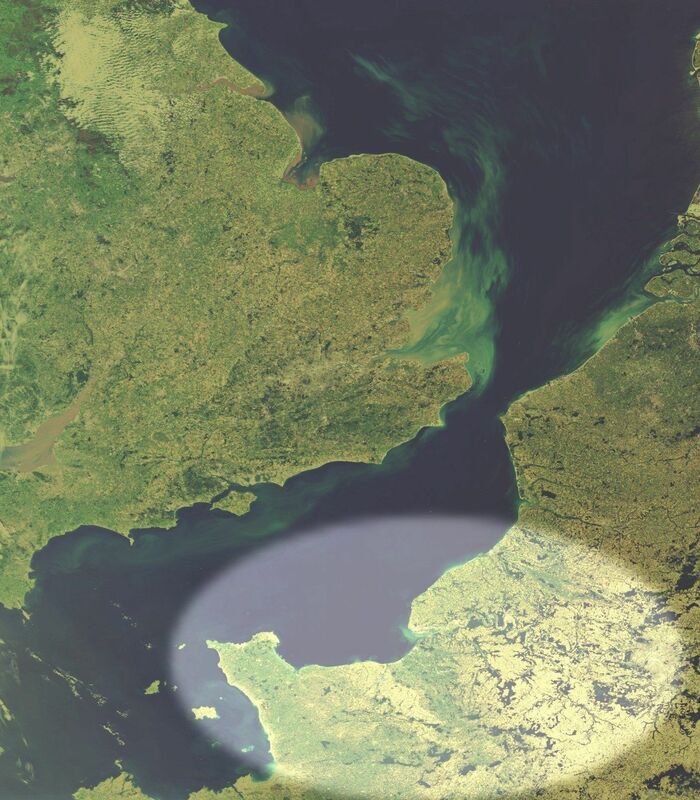 They were interested in the possibility of holding their annual Arab Christian international conference in Houlgate next spring. They were given contact details at the church so they could discuss the possibility further. Pourquoi lire la Bible aujourd'hui? Why read the Bible today? On Tuesday, August 21st an evening meeting was held where Allan Kitt from Le Havre spoke on the question "Why read the Bible today?". Allan is pastor of the evangelical church "La Bonne Nouvelle" (Good News) in Le Havre. While attendance at the meeting was low, there was much appreciation of the message, as reflected in the public questions in the Q&A session after the talk, and in individual discussions after the meeting was officially closed. The Expo did not simply have a local impact, though we did get some visitors who were residents in the area. We also had visitors from many international backgrounds: China, Cambodia, Madagascar, Ivory Coast, Egypt. Morocco, Germany, Belgium, Holland, Spain, France (of course! ), even some from England and Wales - and probably many other countries too! They were from many religious backgrounds too, including Protestant, Evangelical and Catholic Christian, together with Atheist and Muslim. English-language worship services were held in the church for the four Sundays in August. On the 19th, fifteen minutes after the time the service should have begun there was no congregation! But then three ladies turned up, of Asian background. They could speak French a lot better than English too! We decided to go ahead with the service - adapting order, content and message on the fly... At the end of the service the ladies expressed their appreciation of the service. One of them said how much she had gained from the service that would help her to be a better witness to the Lord in her difficult home situation. The day before - Saturday, August 18th -- the French pastor who was due to preach at the 10.30 a.m. French service that Sunday had had to go to hospital, so they called on the "Expo Bible" team to provide a message at short notice! 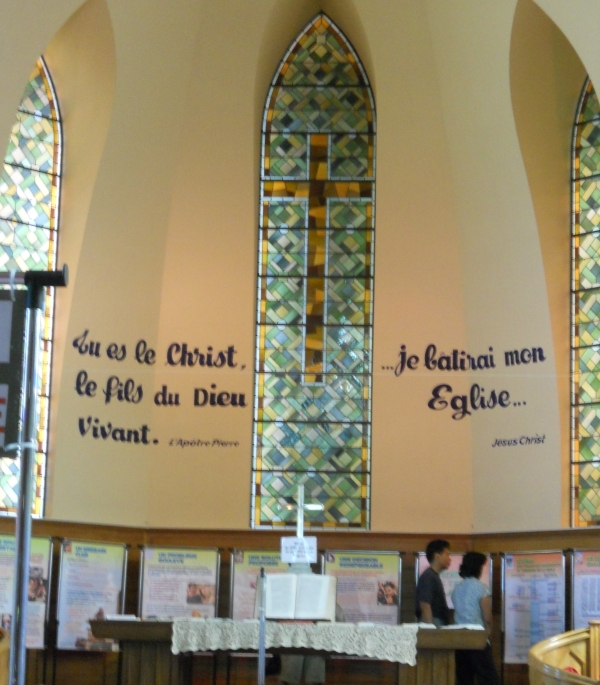 The message on the theme "I will build my church", whose text in French - Je bâtirai mon Eglise - is painted in big letters on the front wall of the church, was preached in English, with simultaneous translation into French. Appreciative remarks were made by many of the congregation at the end of the service, many of whom were visitors on holiday in the area. It was also the Sunday when Houlgate has its ceremony to remember being liberated in 1944 from the occupying force, so just after the end of the message there was a march past by the town band on its way to the memorial in the car park beside the church! On the final Monday of the Expo two of the team - Tim Moore and Philip Loose - drove down to the town of St. Lunaire just over the Normandy border into Brittany. St. Lunaire is not far from St. Malo and is a small seaside resort. 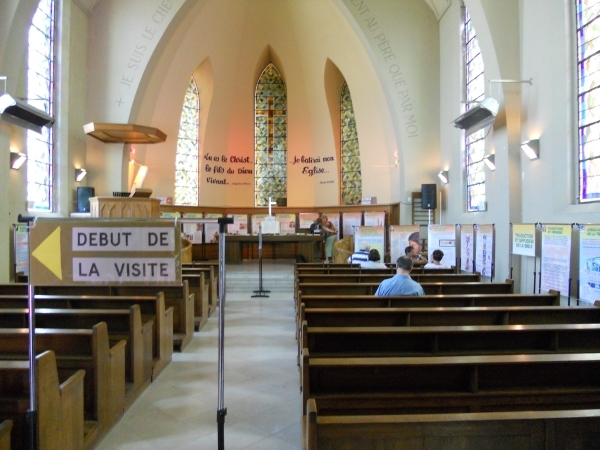 There is also a Christian centre there: Centre des Jeunes (CDJ), though it caters for the not so young too! In the town there is an evangelical church. In previous years a team from Missions Vacances, which is part of UBM (United Beach Missions), has held a beach mission in the town, linked to both the CDJ and the evangelical church. 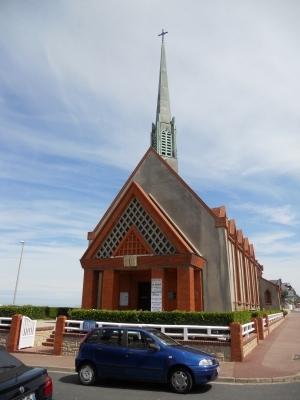 Tim, who normally works with Missions Vacances, but this year joined with Normandy Vision to help with the Expo Bible at Houlgate, took the opportunity of being only a hundred miles or so away in Normandy to visit people he knew at the CDJ, at the evangelical church and in the town. 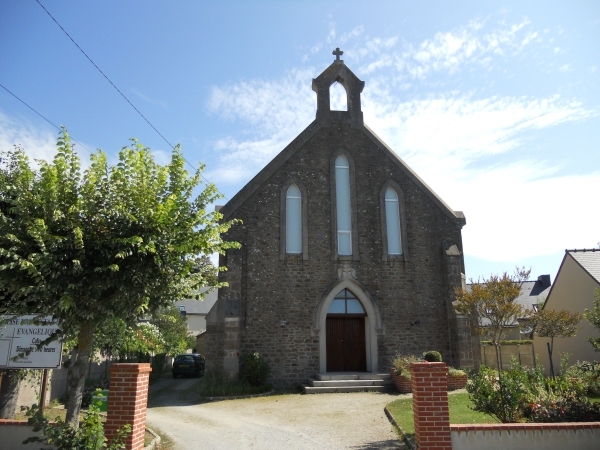 We also considered the possibility of holding the same Bible Exhibition that takes place annually in Houlgate in the church at St. Lunaire too. While there may be space within the church to set out all the exhibition panels and associated materials, there would be many other factors to consider too, such as the location of the church, accommodation of team members etc. before coming up with any proposal to the evangelical church there about the possibility of holding an Expo there some time next summer. Talking of Missions Vacances and beach missions, they used to hold one at Houlgate every summer. The last one took place over a decade ago. One evening, just as we were closing the Expo, a young lady and her daughter were sitting on the steps just inside the church gate. She said she was looking for the meetings run by Missions Vacances which her mother used to take her too when she was a young girl fifteen years or so ago. She had in her turn brought her daughter to see the church and beach where the Missions Vacances meetings took place. One of the Normandy Vision team, Pam, was on the Missions Vacances team fifteen years ago, and remembered the lady, then a young girl, and her mother. The family are Muslim, but had many happy memories of hearing the gospel of Jesus Christ spoken about on the beach. Please pray for all the people highlighted in this report, together with the much larger number of visitors who have not been mentioned. Pray for those who were Christians that they will be encouraged to read their Bibles more by what they saw at the Expo, and that their faith in the Lord Jesus would grow as a consequence. 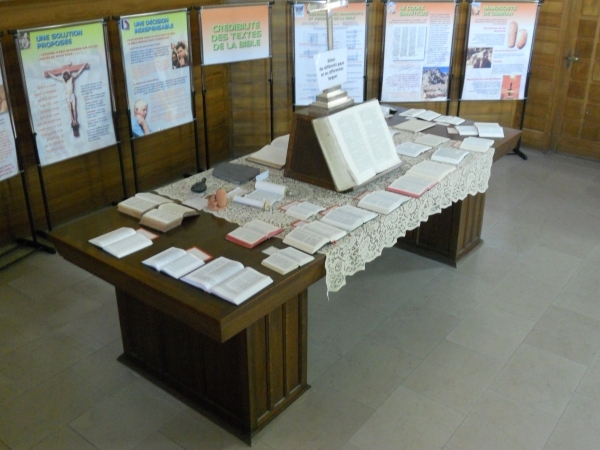 For the many others, pray that the message of the Expo, with its emphasis on the Bible pointing to the Lord Jesus Christ and what he did on the cross, together with its emphasis on reading the Bible for yourself, and responding to it, would have an impact in the lives of many of the visitors. As most of the visitors are holidaymakers from other parts of France, or even the world, it is very rare that we get feedback on how people's lives are impacted and changed by the Expo. Occasionally, as in the case of the mother and daughter highlighted above, we hear of them coming to faith in the Lord Jesus and their lives being transformed. But whether we hear or not, we know that the Word of God can touch and transform people's lives as it opens them up to the grace of God. It is now time to think about Expo-Bible 2013 at Houlgate! So don't forget to start praying for it now. If you would like to find out more about how you can be part of Expo-Bible 2013, as a prayer partner, by being part of the team, or through your financial support, please get in touch with Normandy Vision.